It's no secret that beloved artist Mary Engelbreit isn't the chef in her family, but that doesn't mean she doesn't appreciate and love good food! So for 120 Slow Cooker Recipe Favorites, Mary called upon her family, fans, and friends to offer up their time-tested, go-to favorite slow cooker recipes. Included in the book are delicious chilis, time-tested pot roasts, easy-peasy desserts, and hundreds of other slow cooker recipes-a 120 crowd-pleasing recipes in all-and decorated throughout with Mary's stunning artwork! On the subject of cooking, Mary Englebreit once stated, "If my family had to depend on me for food, they would starve to death in a really cute kitchen." 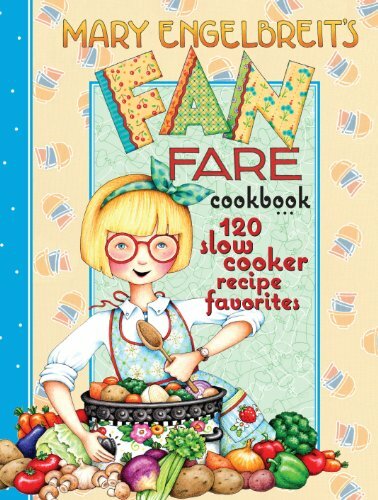 So for 120 Slow Cooker Recipe Favorites: Mary Englebreit's Fan Fare Cookbook, Mary called upon family, friends, and fans to submit their all-time favorite slow cooker recipes. 120 Slow Cooker Recipe Favorites is a beautiful collection of prep-it-and-forget-it dishes paired with Mary Englebreit's distinctive artwork. Winning submissions include everything from chilis to dumplings, soups, stews, hearty entrees, and flavorful side dishes, as well as tasty appetizers and even a few decadent slow cooker desserts. Consider cooking up a pot of Slovenian Stew, Vegetable Soup, or American-Style Boeuf Bourguignon, served alongside GiGi's Creamy Zucchini or Mimmy's Apple, Sausage, and Cranberry Stuffing. Finish the meal with Indian Corn Pudding or Slow Cooker Carrot Cake. 120 Slow Cooker Recipe Favorites is an artful and inspiring cookbook for home cooks who live an on-the-go lifestyle but don't want to sacrifice delicious family meals.